These readily available orchids are easy to grow in Melbourne’s climate and, once mature, flower regularly each year. A judicious choice of species and hybrids can extend the flowering period from spring to midsummer. Sarcochilus hartmannii is one of the most popular species in cultivation. 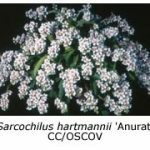 Its range extends from central New South Wales to Queensland, where it is usually found growing at medium altitudes in lightly shaded areas. It is therefore well adapted to shade house cultivation in Melbourne. Like many other sarcochilus species, it grows amongst leaf litter in a variety of locations, or as a lithophyte on rocks. Although it can be grown on a slab of wood or tree fern, I prefer pot culture, using a mix of pine bark and small pebbles to ensure good drainage. Sarcochilus hartmannii tolerates higher light levels than some species and grows and flowers well under 50% shadecloth. Plants hung high in the shade house during winter benefit from the slightly warmer and brighter conditions. The better forms of S. hartmannii, especially those originally collected from Blue Nob in the Nightcap Ranges, south of Murwillimbah in northern NSW, produce glistening white, shapely flowers on a semi-upright inflorescence. Sarcochilus aequalis, known as the southern form of S. hartmannii before it was recently accorded separate species status, flowers in early spring and produces smaller, cream-coloured flowers on crowded, pendulous spikes. It grows well in Melbourne and eventually develops into a spectacular specimen plant. Sarcochilus fitzgeraldii, sometimes called the ‘ravine orchid’, has white or cream flowers with a central red blotch or spots. It flowers in the spring and grows well in Melbourne. As its common name suggests, it is found in ravines and moist gullies, enjoying much more shade than S. hartmannii. Its main requirement is a cool, airy spot with 70-80% shade and plenty of water during its active growing period. Most growers choose a wide, shallow pot to accomodate its extensive root system and use a coarse mixture of bark chunks and pieces of sandstone or river pebbles as potting mix. S. fitzgeraldii tends to grow in a creeping fashion, its leaves flattened and curved inwards, rather than following the more upright growth habit of S. hartmannii. While there are many attractive cultivars, the eye-catching flowers of S. fitzgeraldii ’50 cents’ are noteworthy for their large size and deep red centre. Sarcochilus falcatus is another cool-growing species suited to Melbourne’s climate, although some growers find it is a difficult species to grow well. 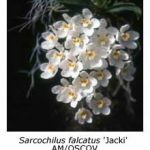 Commonly known as ‘the orange blossom orchid’, its white sepals and petals and yellow-margined labellum make Sarcochilus falcatus a most attractive orchid. 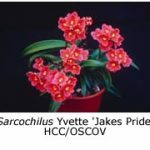 Its range extends from eastern Victoria to Queensland, the flowers differing in size, petal shape and lip markings at various locations, although their overall colour remains constant. S. falcatus grows well when mounted on a weathered slab, tree branch, tree fern or natural cork. Small terracotta pots with an open mix have also proved to be successful in starting a plant in cultivation. Sarcochilus ceciliae grows on rocky outcrops in the mountains of northern Queensland. It has beautiful pink flowers carried on upright inflorescences, however the growth tends to be sparse and straggly, and its narrow leaves give the impression that the plant is ‘on its last legs’. This is generally not the case, as it is a tenacious orchid, well adapted to surviving long dry spells. Shallow pots should be used, as S. ceciliae is basically surface-rooting. A potting mix of small rocks (scoria, sandstone, limestone) and larger bark chunks is suitable. It is essential that the roots not be covered by the potting mix when transplanting; simply place the plant on top of the potting mix and secure it with fishing line or wire pegs. Some S. ceciliae hybrids, such as S. Lois, also seem to grow better if potted in this way. 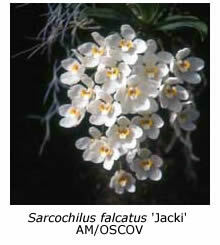 While there are several other sarcochilus species, most are poor growers outside their natural habitat. You will occasionally see the lovely green flowers of Sarcochilus olivaceous or the small pink flowers of S. hillii on the show bench, but many of the others, such as S. australis, native of the Otways and wet bushland areas of Gippsland, are difficult to cultivate. Some growers have kept these species going on their natural bush mounts and have used them in hybridising. Sarcochilus Hybrids. 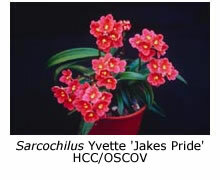 One of the first hybrids, produced in 1963, was S. Fitzhart, bred from S. hartmannii and S. fitzgeraldii. 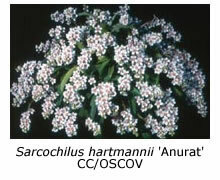 Its flowers are usually white to pink with solid or spotted centres, and held on upright inflorescences. Over recent years, as better ‘line-bred’ cultivars of S. hartmannii and S. fitzgeraldii have become available, S. Fitzhart has been re-made many times, with consequent improvement in flower shape, colour and size. Other common hybrids include S Heidi (S. Fitzhart x S. hartmannii), S. Melba (S. hartmannii x S. falcatus), S. Lois (S. hartmannii x S. ceciliae), S. Mavis (S. ceciliae x S. fitzgeraldii), S. Pinky (S. Mavis x S. hartmannii) and S. Bongeen (S. Mavis x S. fitzgeraldii), to name a few. Recent hybrids include S. Rosalie, S. Powder Puff, S. Colonial Rose, S. Penny Ann, S. First Light, S. Otways, S. Pink Blossom, S. Selina, S. Lone Star, S. Peach Spot, S. Sun Spot, S. Jewell, S. Wandjina and S. James Woolf. You should look out for these more recent hybrids as most have superior colour, shape or character.